Pediatric Unit From the painted flower garden to the bright and cheerful patient rooms, everything is designed with kids in mind! A colorful wall mural featuring a painted flower garden complete with painted insects and reflective surfaces helps set the tone for a speedy recovery in the Pediatric Unit. The six, large, private patient rooms are designed with kids of all ages in mind! Each patient’s room features a child-size bathtub, a built-in desk with wireless internet capabilities, DVD/VCR player with a variety of DVDs, and plenty of storage. Recognizing the importance of having loved ones at a child’s bedside at all times, we offer sleeping arrangements and showers for parents. The mission of the Pediatric staff is to serve the medical, emotional, and developmental needs of all children and their families in a safe and nurturing environment. 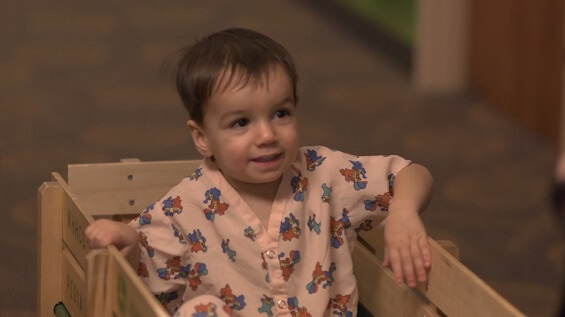 Pediatric patients receive the highest quality care from a professional team celebrated for their compassion, devotion and commitment to children. Providing family-centered care with parent participation and decision making involvement is emphasized by both physicians and nurses caring for each pediatric patient at Memorial Hospital and Health Care Center. For more information on the Pediatric Unit, please call 812-996-0212.